These thermocouples can be customized to the needed length (75mm or 3” minimum) using a standard tube cutter, being careful not to cut into the extension wire insulation. Adding compression or spring loading fittings allows the thermocouple to be adapted to a wide variety of immersion type applications. Note: For 482°C (900°F) Fiberglass cable insulation, change “TT” to “GG” in model number (same price). For 540°C (1000°F) Fiberglass cable insulation, change “TT” to “HH” in model number and add $14 to the price. For a grounded thermocouple tip, change the “U” in the model number to “G” at no additional charge. 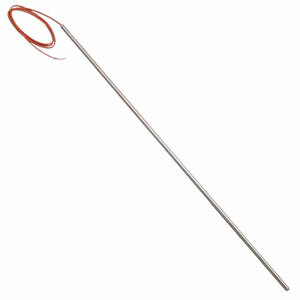 Note, these cut to length thermocouples are not available in 3mm or 1/8" diameter versions. Options: Add a standard sized connector by adding “-OTPW” to the model number for additional cost. Add a miniature connector by adding “-SMPW” to the model number for additional cost. Accessories: Stainless Steel and Brass compression fittings are available for mounting, see “SSLK or BRLK” fittings.